Powerhouse all-in-one media player, playlist (including full screen video), converter, editor, recorder, and much more. 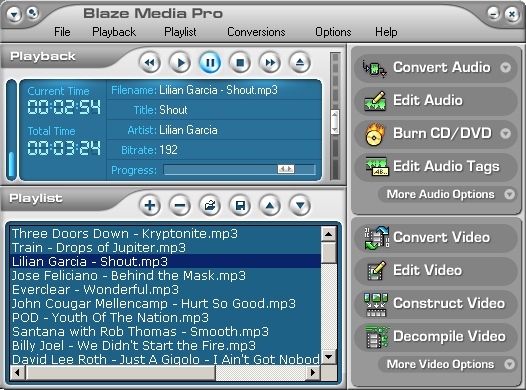 Other advanced features include audio and data CD/DVD recording, video capture, video creation/combining/extraction, video editing, batch video processing, media management, audio merge, MusicID audio recognition, lyrics search, and more. The audio content of video files can be extracted and saved to sound files, and frames can also be extracted to images files in batch mode. Video files can also be created from still frame images and/or other videos. Supported conversions include: CD to WAV, MP3, WMA, and OGG; MP3/WMA/OGG/WAV/AIF/VOX/MP2/MPC/G.72x/AU/RAW to MP3/WMA/OGG/WAV; WAV/MP3/WMA/OGG to CD burning, WAV/MP3 Compression, and two-way conversions among MPEG-1, MPEG-2, AVI, WMV, Multi-Page TIFF, and FLIC. MPEG options are available for VCD, SVCD, and DVD compliant output. When converting from audio CD, track information can be dynamically downloaded from the CDDB and used to automatically name saved files. Video editing is available for AVI (uncompressed), AVI (compressed using any available codec), MPEG-1, MPEG-2, WMV, and ASF. Comprehensive video editing operations are provided (delete frame, delete selection, crop, resize, rotate, mirror, flip, trim, text overlay, adjust audio volume, etc.). In addition, an extensive list of over 30 effects and color adjustment operations allow for powerful video enhancement and alternation. WAV, WMA, and MP3 audio files can be inserted into the video or extracted from the video; and BMP, GIF, JPG, PCX, PNG, RAS, PPM, TGA, and TIF are the supported image formats that can be inserted or extracted. Most video processing operations can also be performed in batch mode on a list of video files using the software's Batch Video Processor. Complete drag and drop capabilities, fully skinnable interface, audio tag editing, CDDB support, and versatile preferences (for maximum control) are also present.